In 1935, President Roosevelt established the Works Progress Administration, later called the WPA as part of his New Deal program to put millions of unemployed Americans back to work. Federal Project Number One was to fund artists, musicians, actors and writers through the Federal Art Project, FAP. The New Deal administrators believed art could be a part of the daily lives of all Americans, not just the elite. FAP absorbed New York Mayor LaGuardia�s earlier Poster Project and thus began a poster division within FAP, itself part of the WPA. The New York City group encouraged bold colors in a variety of styles thus raising poster art to a true art form. FAP artists were soon creating posters in at least 18 states with large groups in New York, Chicago and Philadelphia. Originally created by hand, silk screening had been developed at Stern Brothers Department Store in New York City and it became the popular reproduction process. Production reached a volume of 600 posters a day! The WPA FPA Project from 1936 to 1942 consisted of over 2000 boldly colored and graphically diverse designs. The designs were to portray the issues of Health and Safety, Cultural Programs, Travel and Tourism, Educational Programs, Community Activities, Federal Projects and eventually patriotism during World War II. The Travel and Tourism posters promoted "See America". 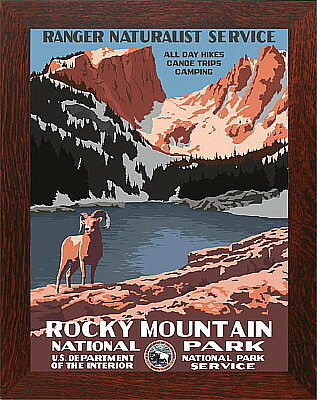 They included and became famous for their dramatic presentations of America�s famous National Parks. By 1942 the WPA FPA had been absorbed by the Defense Department with the purpose of printing patriotic War posters. That project created thirty-five thousand designs and two million posters. Our 17" x 23 1/2" posters are remastered high quality lithographed reproductions printed in the USA on 80 pound stock with a matte finish. All the posters are the same size (the originals were not) framed in a 21" x 27" quartersawn oak 'Oak Park' frame under glass by Dard Hunter Studios. PLEASE NOTE: the posters are shipped from Ohio and due to size they ship 'oversize' which requires a $25 shipping surcharge. But we can ship two framed posters in one carton so the shipping surcharge expense for two posters is the same as for one. Please consider ordering the framed posters in sets of 2, 4, 6 etc to save on the shipping surcharge. See the first item of the listing below to order in multiples of 2!